It has been over three weeks since my last post, in which I introduced my particular aesthetic dilemma, namely: Is my art veering in the direction of illustration? Is that what I want? 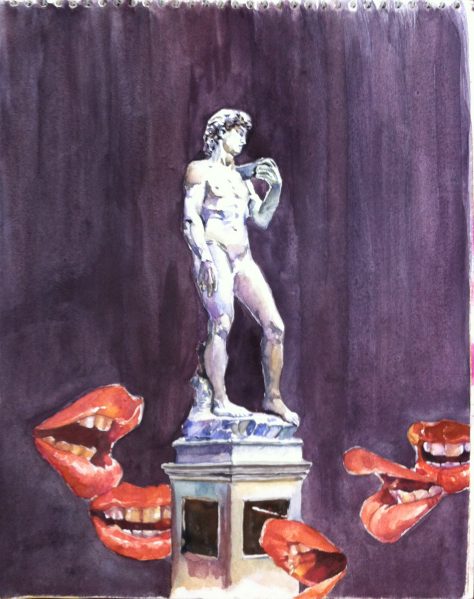 What is the difference between art and illustration? As my previous post shows, I have used T.S. Eliot’s poem “The Love Song of J. Alfred Prufrock” (first published in 1915) to frame my discussion about what is art and what is illustration. 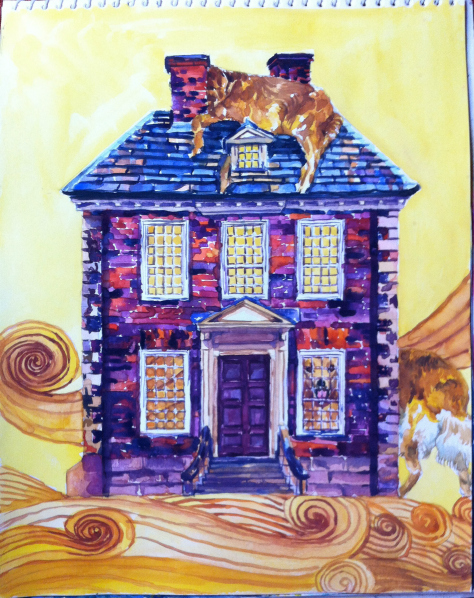 I posted a couple of illustrations based on the imagery Eliot has used in the poem. (Two more coming up in this post!) In my mind, there is no doubt that what I have created is not art. Art has to reflect its maker’s concerns. Nor should it spell out these concerns, as George Williams, my painting instructor from college, would add. 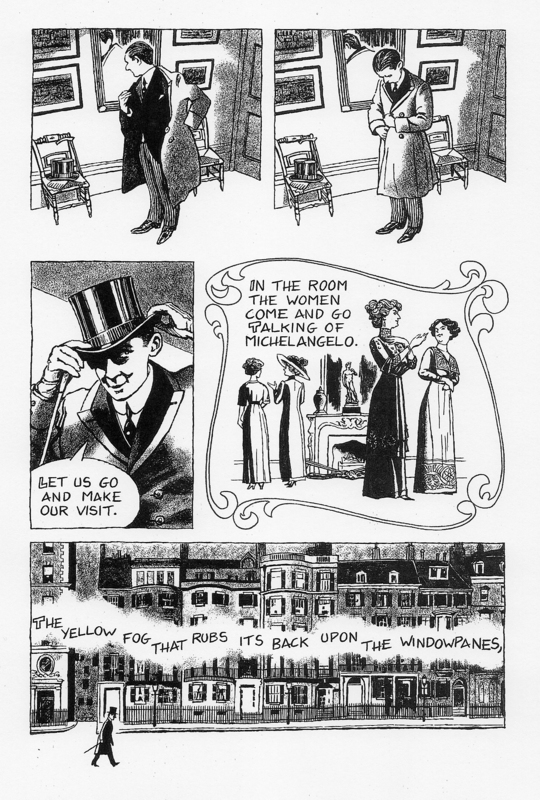 At this point, it would be useful to mention the work of illustrator Julian Peters, who has created a brilliant comic-book adaptation of “Prufrock” (see http://julianpeterscomics.com/page-1-the-love-song-of-j-alfred-prufrock-by-t-s-eliot/). The Edwardian ladies who “come and go/Talking of Michelangelo” and take “toast and tea” feature prominently. A maid brings in the decapitated head of the protagonist on a platter, as if he were John the Baptist. And yes, there is that literal “light brown hair” on a lady’s arm. 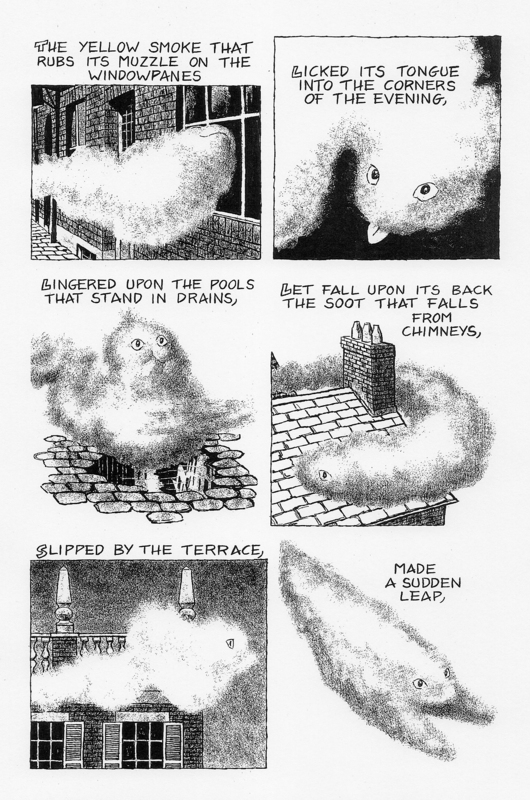 Each panel is accompanied by a line from the poem, so that the reader/viewer knows exactly what each image is about. Everything is spelled out so beautifully, Peters has made Eliot’s dense poem so easy to understand. But in the process one runs the risk of accepting the illustrator’s interpretation of the poem, as authoritative. On its own, “Prufrock” is a work of art that invites the reader to ponder over and appreciate the virtuoso manner in which the poet has combined colloquialisms, snatches of conversation, literary devices, allusions to Shakespearean and Biblical characters, etc. In the context of a comic-book adaptation, however, it loses its richness: the illustrations become a crutch for readers who just want someone to explain to them what the poem means. Left: Water-colours, 2014, © Faiza Mahmud. Right: © Julian Peters. Click for larger images. After examining the above images, I have come up with a couple of observations. My first is that when one sees the name Michelangelo, one automatically thinks of the statue of David! Perhaps the issue is one of association and convenience; after all, the statue of David is far easier to reproduce than the Sistine Chapel ceiling. My second observation is that my own approach to illustration diverges quite greatly from that of Peters’ — without Eliot’s words, nobody would be able to accurately guess what my images are about, while the same is not true of Peters’ work. It follows, then, that perhaps the relationship between art and illustration is not quite a dichotomous one, that it might be useful to instead think of art and illustration as existing on opposite ends of a continuum. In this re-imagined scheme of things, my illustrations of Eliot’s poem lie somewhere in the middle. How am I to push this particular work in the direction of my goal, i.e., art? What lies at stake is not so much the techniques I have used, but rather what I am trying to say as an artist. I want to find my own voice, not speak with Eliot’s or anybody else’s voice. Just like Roy Lichtenstein used Ben-Day dots, I could borrow the language of illustration and still be able to create art. Even if I go on to produce work that resembles children’s book illustrations, I would feel fulfilled as long as what I create conveys what is important to me, both as an artist and as a woman. After all, on the face of things, “Little Red Riding Hood and the Wolf” is a sweet and charming fairy-tale, but is in fact a cautionary, symbolism-filled story that contains lessons for both children and the adults who are responsible for them.